Your carpet goes through a lot in summertime. Whether it’s the kids treading in mud, extra footfall from family BBQ’s or pesky pet accidents, it’s no wonder your flooring might not be looking its best – but don’t worry. With our 5 top tips you can keep your carpets clean and still have time to enjoy the sun (while it lasts). One sure-fire way to keep your carpets looking spick and span this summer is to become a shoe free household. Yes, it seems simple enough. But with kids, family and friends trekking in and out the house it’s an easy way to reduce mud, dirt and moisture getting trapped in your carpet. In summer your carpet sees a lot of traffic and that means you should try your best to stay on top of the cleaning routine. 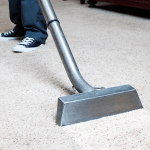 Regularly vacuuming your carpets prevents excessive wear and tear. It also removes dust, pet hair and allergens from the fibres, making it suitable for your little ones to crawl around. In high footfall areas, such as hallways and doorways, the carpet can often wear down and become tired and dull. Prevent these issues with doormats, rugs and hallway runners. This provides a place for people to wipe their feet and keeps your beautiful carpets fresh and clean for longer. Whether it’s an accidental red wine spill or a stain from a messy pup, it’s important you tackle spillages as soon as they occur. The longer it’s left, the harder it will be to remove the stain completely. Remember to blot rather than rub the spill, as this helps lift the spot from the surface. Why not try our safe and non-toxic Spot Remover for free? This is a concentrated solution which can remove even the most stubborn of spills. Are your carpets looking dirty this summer? Have you tried everything you can, but just can’t fix that big stain? Then it’s time you get the professional in. While you could try to hire a carpet cleaning machine, this is often a time-consuming and costly option. You also risk damaging carpets with harsh and toxic chemicals. However, with professional carpet cleaners you can be confident that you’re getting quality cleaning that will extend the life of your carpets. At Clean & Dry we offer a thorough and hassle-free carpet cleaning service in Sheffield to make your home feel brighter, fresher and cleaner for longer. Best of all, our work is backed by our 100% guarantee.